Glenn Robinson III scored a career-best 23 points Saturday night. ANN ARBOR, Mich. (AP) — Michigan knows it might not have preseason All-American Mitch McGary in the lineup again this season but Glenn Robinson III and the Wolverines showed all probably isn’t lost. Robinson scored a career-best 23 points Saturday night and the players who will fill McGary’s role combined for 16 points and 10 rebounds to help the Wolverines finish their preconference schedule with an 88-66 victory over Holy Cross. Nik Stauskas and Caris LeVert each added 16 points for Michigan (8-4), which won its second straight and pushed its winning streak over unranked opponents at Crisler Center to 19 games. "I still had to keep up an aggressive mentality," Robinson said. "That’s what the team needs from me." The Crusaders (6-6) stayed close for much of the first half but Michigan pulled away by outscoring its guests 11-4 in the final four minutes and led 42-30 at intermission. Dave Dudzinski scored 17 points and Justin Burrell added 14 for Holy Cross, which has lost three of its last four games. The Wolverines were 16 for 27 from the floor in the first half but the Crusaders stayed on their heels by making four 3-pointers and turned the ball over only twice. Holy Cross never got closer than nine points the rest of the night. The Wolverines pulled away early in the second half and gave fans plenty of time to get home and watch Michigan’s football team play in the Buffalo Wild Wings Bowl late Saturday. Michigan’s victory came a day after the team learned McGary will have surgery to address a lingering injury to his lower back. The preseason All-American averaged 9.5 points and 8.3 rebounds in the eight games he played this season. Coach John Beilein was pleased with the play of center Jordan Morgan and reserve forward Jon Horford. Morgan had six points and five rebounds while Horford added 10 and five boards. "Sixteen and 10 is a pretty good number," the coach said. "If Mitch McGary did that, everyone would be talking about him." Morgan, the Wolverines’ lone senior, said the team’s frontcourt has gotten better despite not having McGary in practice or some games. "If he can’t play with us, we have to do all we can to move forward," he said. "Guys have played a lot without him. It’s not like we’re throwing (inexperienced) guys out there." 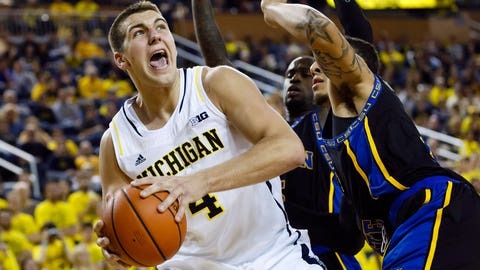 The school said Saturday that McGary’s surgery has yet to be scheduled. There is no timetable for the sophomore’s return. His play during the Wolverines’ run to last season’s national championship game helped shoot his name to the top of many NBA mock draft lists. He averaged more than 14 points and 10 rebounds during Michigan’s six-game run last spring. McGary missed Michigan’s first two games and did not play in its most recent contest, a 68-65 victory at Stanford on Dec. 21. Robinson, who, along with McGary opted to return to Michigan this season, heard the news before the rest of the team. "It’s a rough experience for a guy like Mitch," he said. "He’s like a brother to me. "I know he’ll come back stronger." The Wolverines begin Big Ten play Thursday at Minnesota.